Inspired by a true story, Jesus Tree follows the life of Ben Jordan, a black man falsely imprisoned for the Depression Era murder of a middle Georgia Methodist minister. He returns to his hometown after completing his sentence for a showdown with the real murderer, the wealthiest man in town. "Coastal Georgia in the depths of the Great Depression. A white minister is murdered and a young African-American man is convicted of the killing and sent to a brutal prison farm. Forty years later, Ben Jordan finally emerges a free man, struggling to understand a world that has undergone profound change, and sets out on a mission to bring the true killer to justice. 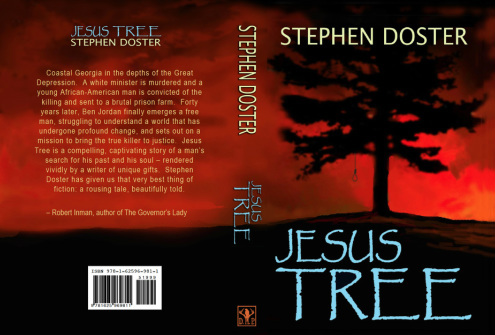 Jesus Tree is a compelling, captivating story of a man’s search for his past and his soul – rendered vividly by a writer of unique gifts. Stephen Doster has given us that very best thing of fiction: a rousing tale, beautifully told." Lord Baltimore is a novel set on the Georgia coast pitting a spoiled country club slacker and his mysterious vagabond-mentor, Lord Baltimore, against a corrupt high sheriff, a voodoo doctor, an ex-pugilist turned evangelist, and a hurricane. Nominated for a Pulitzer. From Library Journal: This first novel, a picaresque set in the coastal area of South Georgia, calls to mind some of the best of the genre, including Mark Twain's Huckleberry Finn and James Howard Kunstler's An Embarrassment of Riches. At age 17, Ensworth Harding shows little ambition or promise, having spent most of his life hanging out at the local golf club on St. Simons Island, GA. On Ensworth's 18th birthday, his father drives him to the Coastal Highway, points him north, and kicks him out of the car with $100 and a letter to deliver to a law firm in Savannah. The next month proves the most memorable of Ensworth's life, as he wanders the Georgia coast, blundering into and out of drug deals, jailbreaks, attempted suicides, and revival meetings, and encountering the worst and best of society. Along the way he meets crooked politicians, a jail escapee, a witch doctor, an elderly Gullah gentleman who speaks only Latin, a possible ghost, and, most importantly, Lord Baltimore, his personal guide and protector who produces and directs many of the adventures firsthand. A wonderful coming-of-age novel, Lord Baltimore will appeal to youth as well as adults for its fantasy, adventure, and basic truths. From Booklist: On his eighteenth birthday, pampered rich boy Ensworth Harding is unceremoniously dumped on the side of a dusty Georgia highway by his self-made father. Given a new pair of sneakers, a backpack, a sealed envelope, and strict instructions to walk to Savannah and deliver the envelope or face disinheritance, he embarks on an instructive, often-hilarious open-road odyssey. Tempted to return home but fearful of his father's wrath, the supremely naive Ensworth embarks on a life-altering journey into manhood via the remote backwaters of the rural South. He is joined on his mission by an unkempt pseudo-British knight calling himself Lord Baltimore, and Ensworth and his eccentric sidekick encounter a string of con men, ne'er-do-wells, and free spirits and share a marvelously bizarre series of adventures. Pursued by a vengeful, drug-dealing sheriff, they hide out on a remote Gullah island off the coast of Georgia, awaiting an inevitable confrontation. First-time novelist Doster hits all the right comical and serious notes in this fantastical coming-of-age yarn. Voices from St. Simons is a compilation of interviews with descendants of slaves, descendants of plantation owners, and other long time residents of St. Simons Island, a barrier island located off the Georgia coast between Savannah, Georgia and Jacksonville, Florida. "I'm a native of St. Simons Island, so this is a subject near and dear to me. The author has done a terrific job capturing the heart and soul of this wonderful place through the recollections of the people who live there. Most visitors to the island are instantly captivated by its charm and easy-going lifestyle. There's a magical appeal and the narratives of the author's sources capture this essence. A must read for anyone interested in stories from the Old South." Rose Bush, southern fiction, is a love story entwined with politics and environmental issues. A mystical story of starting over, political ladder climbing, and the Guiding Hand which, no matter how hard you try to fight it, is always there. A young widower moves to Sprite, Georgia to forget his recent tragedy and bury himself in the work of saving a decrepit paper mill from closing. Little does he know he is a key player in larger forces at play that have been decades in the making. This story would appeal to those who like the nitty-gritty of politics, environmentalists who cringe at the sight of a smoke stack, and history buffs who know the past never really dies and often shows up on your doorstep when least expected. Shadow Child is a collection of short stories that span the eras of Spanish missions, English occupation, and the Antebellum South...a melding of historical events and connecting story lines with a variety of intriguing and entertaining plots (some with Twilight Zone-esque twists) tied together by a common theme. Voodoo, ghosts, murder, mayhem--the usual stuff of good fiction--is all here in one book. Georgia Witness is a collection of narratives from across the state of Georgia. Attorney General Griffin Bell, land conservationist/Rolling Stones keyboardist Chuck Leavell, Mayor of Atlanta Sam Massell, and Senator Mack Mattingly are among the notable contributors to this oral history. "I actually went to the book launch on St. Simons Island and got my copy there. WOW! I even got to meet six of the incredible people in this book. I wish I could mind-meld with them. The things they accomplished and those they inspired to even more greatness. Mr. Cato and Mr. Brown were so encouraging. In their 90s and still making a difference. Whether you are a Georgian or not, these people were Americans who did what no one else could do at a time when you could be killed for your ideas or your discouraged by your social status. Nothing stood in their way. And to this day, it proves that the only thing that deters us is our thoughts. Remove 'can't', 'never' and 'always' from your vocabulary and you will succeed just like they did." "Lucky Man: Delbert Mann, A Biographical Essay"
A biographical essay about Delbert Mann who won an Academy Award for best director (Marty, 1955, starring Ernest Borgnine). This paper provides an overview of Delbert Mann's life from his community theatre activities in Nashville and Columbia, South Carolina, to his work in the early days of television and his subsequent career as a film director. "An Analysis of the Synagogue Zodiac at Sepphoris: Its Judaization, Symbolism, and Significance"
The zodiac, a pagan symbol believed to have originated in 7th century BCE Babylonia, appears in the floor mosaics of numerous synagogue ruins through the Palestine region, including one found in a fifth century synagogue at Sepphoris, an ancient city located in modern day northern Israel. This paper provides an analysis of the zodiac found in a fifth-century synagogue at Sepphoris, an ancient city near Nazareth. "Christ And The Samaritan Woman: A Via Latina Catacomb Fresco, 340 - 350 CE"
In 1955, construction began on a new apartment building located between the Via Latina and the Via Dino Compagni, two streets in southeast Rome. Workers pouring concrete for the building's foundation were surprised to see the material quickly disappear into the ground. When they traced the seepage to its origin, they discovered a catacomb that had been sealed and hidden from public access centuries earlier. Deep within the catacomb is a fresco of a woman and a man standing on either side of a well. This paper analyzes the fresco known as "Christ and the Samaritan Woman" of the Via Latina Catacomb. "A Brief History of Piracy in the Caribbean: 1500-1730"